Aloe is one of my favorite plants to have growing in the garden. In addition to its many practical uses around the house, it’s an absolute champion in our climate. Deer and rabbits tend to leave it alone, while hummingbirds go crazy for the tall spikes of orange or yellow flowers that often bloom very early in the year. While this plant does enjoy a fairly pest- and disease-free existence, there’s one common critter in Southern Arizona that can cause lots of damage to susceptible aloe species, and it’s a particularly difficult critter to treat! You’ll never see an aloe mite (Aceria aloinis) crawling around on your aloes, but you can definitely see the damage that it leaves behind. While feeding on plant tissues, this microscopic relative of the spider injects a chemical into the plant that causes masses of warty, tumorous-looking growths on leaves, stems, and flowering stalks. This mass, called aloe cancer, aloe wart, or aloe gall, will often grow around the tiny insects, protecting them from the outside world while they feed on the rapidly-growing tissues and lay eggs. Until these strange growths show up on your aloe, it’s impossible to know that the mites are present. Contact insecticides are useless against aloe mites because the little pests reside within the plant’s tissues. Some people have reported marginal success with systemic insecticides, but even if the insects are (miraculously) eradicated, the warty, disfigured growth remains. Physical removal is the only way to get rid of the galls. Some people recommend cutting the growth off of the plant and treating the area with a pesticide that kills arachnids, but the plants often continue to grow the unsightly galls, even after the pests and their current growths have been removed. It’s possible to save an irreplaceable aloe specimen with early detection, removal of galls, and treatment with pesticides, but keeping this plant in your collection runs the risk of spreading the tiny insects to other aloes in your yard or neighborhood. Aloe mites are small enough to travel to new plants on a gust of wind, and treatment of an infestation can be a lengthy, tedious, and expensive endeavor. The best way to protect the rest of your aloes from becoming infested is to remove any affected plants from your collection as soon as you see warts or galls forming. Put the plants in garbage bags and throw them away rather than composting them. Once the problematic aloes have been removed, consider replacing them with a species of aloe that is resistant to these pests. ‘Blue Elf’ aloe would definitely be my top recommendation as a replacement plant. I’ve never once seen a sign of aloe mite attacking this cultivar, and I’ve seen a good many of them growing in all kinds of situations around town. This tough little hybrid grows well in full, reflected sun or dense shade, and it’s also incredibly tolerant of cold winter temperatures down to 15° F! 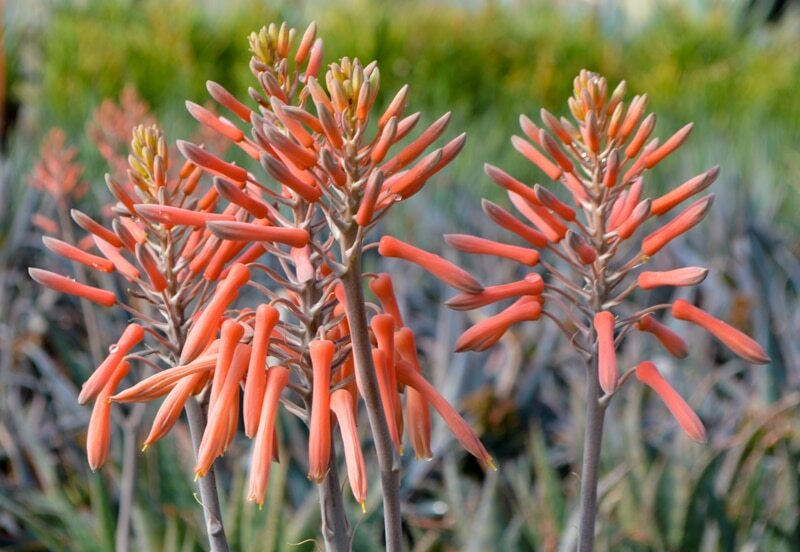 It’s also one of the most attractive and tidy aloes on the market.